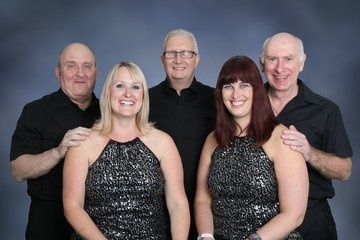 Band on the Run have been together since 1997 and during that time have amassed a wealth of experience and we know exactly what to do to make your event a really memorable, feel- good night. We are a versatile group who are suitable for Weddings, Masonic Ladies nights, Corporate events, Birthday parties, Summer Balls and any other event that you could possibly think of! Made up of 5 very experienced musicians and vocalists, Band on the Run are able to suit any possible type of event, tailoring our playlist for your guests maximum enjoyment. From classic rat-pack tunes, spanning the decades right up to present day chart toppers like Adele, Olly Murs, Robbie Williams and so many more. Four members of the band are strong vocalists and with the highest possible quality of harmonies we have an excellent blend of voices to sing the eclectic range of songs that we have to offer. Our multi stack keyboards provide an amazing depth of sound (strings, brass, woodwind, synth and many more) that is normally associated with a small orchestra, so we create an excellent all round sound. We pride ourselves on our total professionalism on and off the stage and are proud to say that because we have such valuable experience we are able to offer any help and advice you may require with regard to the evenings entertainment, guaranteeing a smooth running event. Band on the Run are also immensely proud of our ability to pack a dance floor where ever we go!! With the several different packages and choices we can offer you including a Master of Ceremonies to co-ordinate your function, we have something for everyone and every event. Visit our website for more details http://www.bandontherun.co.uk/ or contact Ian Rice 01621 817320/ 07802 858843.